Smoking a chicken is EASY! Wow your taste buds with this melt-in-your-mouth Applewood Smoked Chicken! Prepped with a brown sugar, smoky paprika and garlic based rub, this Applewood Smoked Chicken tastes amazing! Who doesn’t love the taste of smoked meat? I’ve never met anyone who didn’t get excited about sitting down to eat a meal that involved any type of smoked meat. Smoked meat is absolutely amazing. And this Applewood Smoked Chicken is fantastic! Easy, fast to prep and super juicy. I tell you…it’s DELISH! And guess what? Spring and summer are right around the corner! Memorial Day will be here before you know it and after that we run right into 4th of July! What’s on your Memorial Day and 4th of July food menu? Have you thought about it? Are you grilling or smoking, or both?!? If you haven’t thought it through, don’t worry…it’s not too late! I’ll help you think of some AMAZING smoked foods! I’m sure you can guess what’s on my menu…yep my Applewood Smoked Chicken! I love to use my smoker. Smoking meat is one of my favorite things to do. A lot of people ask me what types of meat I like to smoke. Well let’s see…I love to smoke salmon, tri tip, ribs and chicken! Oh…and brisket! OH!! And side dishes!! Did you know you can smoke side dishes? I’ve been asked by my friends to post my Applewood Smoked Chicken recipe, so here it is guys right in time for the warm weather! And I’m going to walk you through how I smoke my chicken step-by-step so you know what to expect! By the way, this is MY smoker, not Mr. Mason’s smoker. Most husbands have a smoker and a grill. Nope, not here at Mason Manor. I own the grill and the smoker. I asked my husband for a smoker last Christmas and he was like…really? You want a smoker for your Christmas present? Not clothes or jewelry? Nope. I was tired of only getting smoked meat when I went to a party or a friend’s house. It was time to make my own smoked food! Smoking meat has been a part of my life since I was a little girl. I grew up with my dad telling stories about how he and his dad and brothers used to dig a hole in the ground and smoke an entire hog. At Thanksgiving, Mr. Mason’s family smokes their turkeys and they are so good! So naturally…I NEEDED a smoker! So what did Mr. Mason do? He bought me a smoker. He bought me a Smoke Hollow 38202G 38-Inch 2-Door Propane Gas Smoker. This is a gas smoker that runs off of a propane tank. There are a lot of different types of smokers you can buy…pellet, electric, charcoal….but guys, I wanted easy. I NEED easy in my life! And Mr. Mason knows that so he went with a gas smoker and I absolutely love it! So, let’s jump into how I prep and smoke my Applewood Smoked Chicken. First, let me talk about my rub and wood for a minute. I use (and recommend) wood chunks instead of wood chips for this recipe. I find that chunks produce more smoke and the meat turns out more flavorful. There are so many different types of wood out there and so many different rubs! I have used several different kinds of wood for chicken, but I’ve found that applewood chunks give me the best results when it comes to smoking a chicken. It gives the meat a subtle smoky apple flavor. Ok so let’s going! Step-by-step instructions are below! Brown sugar is just a MUST when you are making a rub. I’ve tried making several rubs, but this one is my favorite when smoking chicken. It’s the perfect mix of smoky and sweet. By the way…this rub is Gluten Free. I buy a whole chicken from either Costco or my local grocery store. I typically buy a 4 to 5 pound chicken. I really like to smoke a whole chicken. You’ll want to first remove and toss out the innards, such as the neck and liver that’s stuffed in the middle of the chicken. From there, you’ll need to rinse the chicken inside and out. Once that’s done, dry the chicken off with a paper towel. Place the whole chicken on a cutting board. Next, take a sharp butcher knife and slice your chicken in half by cutting down the breast. You’re literally going to have to break the sternum so you can split the chicken. From there, pull the breasts apart. I call this step of the process “butterflying” the chicken. Take that rub and sprinkle it all over the chicken. When putting the rub on your chicken, make sure you press the rub into the chicken really well. This helps enhance the flavor. You literally want your chicken to be saturated with the rub. Next, place your chicken in a glass pyrex dish, cover with saran wrap and place in the refrigerator. I like to let my chicken marinate overnight. There’s a couple of things you should do before you start smoking your food. I like to wrap my water bowl with aluminum foil before I add the water. By doing this you’re saving yourself a lot of mess. Less cleanup is always better! I also add about a Tablespoon of Liquid Smoke to my water to help contribute to the smoky flavor. But that’s optional. Are you going to use wood chips or chunks? Are you going to soak them? I prefer using chunks when I smoke my chicken because it’s been my experience they produce more smoke for a longer period of time. And I always soak my chunks. I wrap my wood chunks in aluminum foil and poke holes in the aluminum foil with a knofe. To me, the smoke pouch helps smoke release better which provides more flavor. I preheat my smoker before I place the food in. It takes about 30 minutes to warm up my smoker to 225 degrees. You’re now ready to smoke your chicken! Go ahead and place that rubbed chicken on a rack in the smoker. Let’s talk smoking time for your chicken and temperature for your smoker. I smoke my chicken at around 225 degrees for 4 to 5 hours. Towards the end of the smoking process, I always insert an internal thermometer to ensure the temperature of the chicken is 165 degrees. I insert the digital thermometer at about the 4th hour so I can see how much longer it has before reaching 165 degrees. Make sure to watch the actual smoker temperature and don’t let it go over 250 degrees. Slow and low my friends….you want to smoke this slow and low! Once you meat is done, you’re ready to remove the chicken from the smoker. Look at that gorgeous smoked chicken! Juicy and and delicious! Smoked to perfection! Look at that chicken leg! Perfectly cooked and full of flavor! I highly recommend letting your chicken marinate in the rub overnight. When smoking your chicken, sometimes the smoker temperature will get up to 250, but I never let it go over that. You will need to manage your temperature to ensure the smoker doesn’t get too hot. I use this electrical temperature gauge when smoking my meat…works amazing! You should expect to see a lot of smoke in the first 2 hours and then it will die down a bit. It will smell wonderful outside! Guys, I can’t even explain how much my smoker means to me. I know that sounds silly but when I first got my smoker, my dad came over and we smoked several cuts of meat. Both my dad and I really enjoy cooking and I knew that if I got a smoker we could smoke meat together and compare and create new rub recipes. Daddy and I both smoked chickens today. He decided to take my rub recipe and double the amount of Smoked Paprika. Look at the color difference! Feel free to play around with the amount of Smoked Paprika you use in this rub. It’s fun to experiment! Regardless if you stick to my 1 Tablespoon of Smoked Paprika or double it, the taste is phenomenal! It’s been so fun spending afternoons with dad hovering over the smoker and talking! We have created some fantastic memories together just sitting around talking about our family and his childhood memories. And…my dad ended up buying a smoker shortly after I got mine! It’s just been amazing! You guys are going to LOVE this Applewood Smoked Chicken! 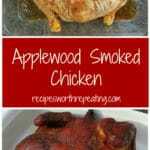 If you’ve tried my Applewood Smoked Chicken, rate the recipe and let me know how it turned out by leaving me a comment below! I love hearing from you! FOLLOW ME on Facebook, Twitter, Instagram and Pinterest because I’m CONSTANTLY posting yummy food that I know you will love! Smoking a chicken is EASY! Wow your tastebuds with this melt-in-your-mouth Applewood Smoked Chicken! Prepped with a brown sugar, smoky paprika and garlic based rub, this smoked chicken tastes amazing! Take the chicken and remove all the inside parts that need to be tossed out, like the liver, neck, etc. Run cold water over your chicken and rinse well. Pat dry. Take the whole chicken and on a cutting board, cut the chicken with a meat cleaver down the middle of the breast. (I like to do this so I can open up the chicken and get the rub everywhere.) Place in a 9x13 glass pyrex dish. In a small bowl, mix all the dry rub ingredients listed above. Generously rub the chicken that is still in the Pyrex dish with the mixture until rub is gone. Place plastic wrap over the Pyrex dish and refrigerate overnight. I like to marinate my chicken for at least 8 to 12 hours. After the chicken has marinated, turn on your smoker (or light it) and let it preheat until the smoker hits 225 degrees. Once preheated, place the whole chicken on the rack breast side up and close your smoker. You should expect to see a lot of smoke in the first 2 hours and then it will die down a bit. It will smell wonderful outside! Smoke the chicken at about 225 degrees for about 4 to 5 hours. Sometimes the smoker temperature will get up to 250, but I never let it go over that. You will need to manage your temperature to ensure the smoker doesn’t get too hot. At the 4th hour, insert a digital thermometer to see how much longer it has before reaching 165 degrees. When the chicken is done, turn the smoker off and remove the chicken. Your chicken should be at 165 degrees. I like to check at the chicken breast and legs. Let the chicken sit for about 10 minutes before slicing and eating. Depending on how many pounds your chicken is will depend on how long the chicken will take to smoke and be completely cooked through. Make sure you are using a thermometer inserted in the chicken to ensure it gets to 165 degrees F.
Update Notes: This post was originally published in June of 2017, but was republished with new photos, step-by-step instructions and tips in April of 2018. Hi!! To be honest…I dont eat the skin. The one time I tried it it was a mix between crisp and rubbery. But since I dont eat the skin, I’ve never had a reason to crisp it up! I hope that is helpful!! Hi Paul – I keep the skin on during smoking. A lot of people like to eat the skin so that’s why I don’t put the rub under the skin or remove it. What kind/type of chicken and how many pounds? Hi DG!! I buy a whole chicken from either Costco or my local grocery store. As for pounds…I typically buy a 4 to 5 pounds chicken. The cook time will be a bit longer based on the size of your chicken so definately watch the inserted thermometer to make sure it gets to 165 degrees F.
Do you really have to cut the chicken in half or can you leave it whole? No – you don’t have to cut it in half. You can smoke it whole. It may take a bit longer to smoke though. My only issue is my guests think I’m a seasoned smoker! I’ve followed this recipe 10+ times with no complaints… it could be a Canadian thing. Best smoked chicken rub and directions. Hi Ben! You LITERALLY just made my day! Wow! Thank you SO much! I am so glad you and your guests love my recipe so much! Again – thank you for your kind words! I made this last night using chicken quarters and everyone loved them! The rub is amazing and we will definitely be making this again and again, thanks so much for the recipe! Hi Alena! I’m SO glad everyone loved this recipe! The rub is definately a winner! Thanks so much for letting me know how they turned out! !